No one has the time or energy to style their hair on a daily basis. Natural hair does not have to be high maintenance if you don’t want it to be. There are multiple ways to preserve your hair’s style and moisture while you sleep and all require minimal effort. Here are five things to consider before plopping on the bed and setting your alarm. Putting your hair into a pineapple is the quickest, simplest way to preserve your curls and add volume overnight. Everyone is not fond of this option but many have had success. Sometimes you have to make the adjustments that work for your texture and length. Pineappleing is coifing your hair atop your crown with a scarf and a loose band to keep your hair in place. This technique reduces the amount of your hair being squashed while you sleep. All it requires is a little fluffing, spritz, or riding with the car windows down to set your hair back in place. Remember, the more you fluff, the more frizz you induce so be careful. If you prefer to wear twist outs or braid outs, then you can retwist your hair in 4-6 chunky twists. No need to detangle, as twisting hair that has a curl memory (i.e. set style) will create enhanced definition. Before going to bed, make sure you either wear a satin bonnet or satin scarf or sleep on a satin pillowcase. To avoid products coming into contact with your face and causing acne, opt for the satin bonnet or satin scarf. Sleeping on a cotton pillowcase will absorb all of the moisture from your hair, leaving your curls dry, frizzy hair in the morning. Try replacing your linen with silk options, especially if a satin bonnet and satin scarf are not appealing to you. Satin bonnets are great for those with long curls and waves. 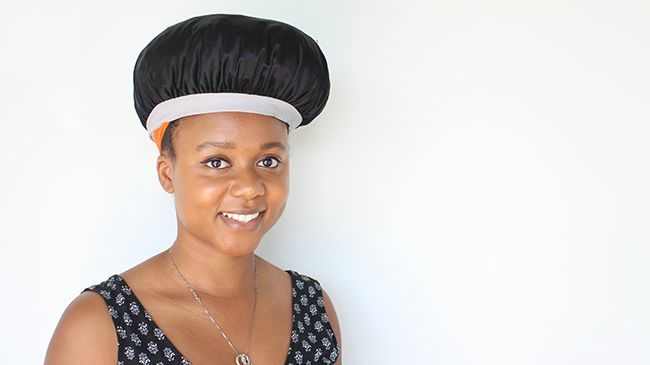 If you want to keep your hair out of your face, then tucking it in a bonnet is a great option. Some women will create two large twists or French braids and then stuff them in their bonnets to prevent tangling while they toss and turn through the night. When you are too tired to retwist your hair at night or if your hair is too short, then a satin bonnet is great alternative to a satin scarf. For a more secure option, wear a satin scarf. Sometimes satin bonnets are too loose and slip off if you are a wild sleeper. Satin scarves are also great when you want to smooth your hairline with edge control for sleek style in the morning. They also help to prevent frizzy roots when your twists or loose hair tousling throughout the night. How do you sleep with your natural hair?